The most visited destinations of Mumbai and Goa are visited for one common reason as well, i.e. for Christian Churches. Remarkable in their construction and role in spreading out the faith, these churches are renowned among the pilgrims. Mumbai Goa Church Tour is an attempt to experience these destinations with a different viewpoint that is serene and spiritual in every way possible. Upon arrival in Mumbai, meet Incredible India tour representative for transfer assistance to the hotel for overnight stay. After breakfast proceed for Mumbai city tour around its churches. The first one, Mt. Mary Church is among the most prominent churches in Mumbai. Devotees visit this iconic church everyday. Located in Bandra close to Bandstand and past Hill road, the original chapel of Mt. Mary was constructed in 1640 and was rebuilt in 1761. This is known to every Mumbaiite who from all religions and faiths come to this shrine and offer their respect to the Mother Mary. Every September, the church comes alive with the feast of the Blessed Virgin Mary celebrations on the first Sunday after 8 September, the birthday of the Virgin Mary. Also known as the Bandra Fair, this week long celebration is attended by thousands of people every year. St. Thomas' Cathedral, the next church is the city's first Anglican Church established in 1672. Located in the commercial fort area, the church is simple in architecture yet exquisite in appeal. 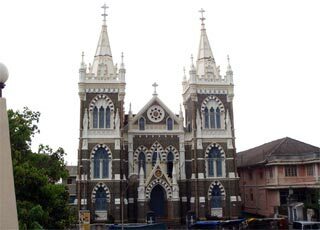 Also visit Afghan Church or The Church of St. John the Evangelist in South Mumbai. Followed by this is the visit to Flora Fountain, colourful Crawford Market and Marine Drive. Overnight in Mumbai. After breakfast, check out Mumbai and transfer to airport to board the connecting flight to Goa. On arrival here, transfer to hotel. Rest of the day free at leisure. Overnight in Goa. After breakfast, begin the discovery of Goa with Old Goa, famous for its notable churches and convents. These churches illustrate the evangelization of Asia and are bedecked with the native Portuguese influence here. 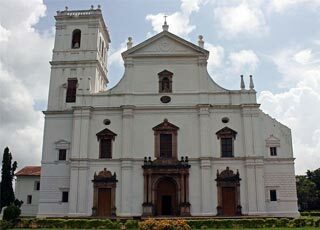 Also recognized as world heritage sites by UNESCO, these churches are one of the prime attractions of Goa tour. This adds on to the appeal and fascination of these churches. St. Anne, Church of St. Francis of Assisi and Basilica of Bom Jesus (enshrining the mortal remains of St. Francis Xavier) form the Christian Pilgrimage to Goa. In the evening enjoy the visit to the Fishing village / Beach. Return to the hotel for overnight stay. After breakfast, enjoy an excursion to Dudhsagar, the milky white waterfalls on the Goa-Karnataka Border. The evening is kept at leisure. Overnight in Goa. After breakfast, check out Goa and board a connecting flight for Mumbai. On arrival here, proceed on to onward destination via scheduled flights.